Each year, when cherries arrive, I revisit a quest to craft a very particular cocktail: a Whiskey Cherry Coke. Cherry cola feels like the quintessential summer soda, and whiskey cokes are a favorite highball in our house. 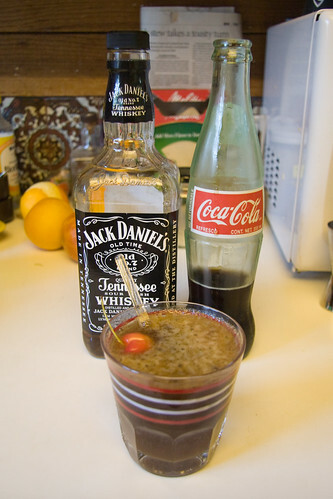 Combining the two was a natural fit, but I wanted to go beyond just mixing Cherry Coke with Jack Daniels, and come up with a recipe using real cherries. Little did I know how hard this would be. Over the years, I’ve attempted numerous tactics to get the right level of cherry flavor and sweetness into my whiskey cokes. Initially, I muddled some whole cherries at the bottom of the glass. This barely imparted any flavor to the drink, and the sweetness in particular was lacking. Cherry cola has both a distinct cherry flavor and a bit more sweetness than regular cola, so it was imperative to have a very sweet cherry flavor. Next I tried muddling a combination of fresh cherries and maraschinos. This was closer, but maraschino cherries kind of gross me out. I’ve asked bars that have toschi cherries to attempt make me one, but those have a distinct flavor that did not fully meld with the cola. For this week’s attempt, I’m using Rainer cherries from Joe Gotelli & Sons, a fruit grower in Lodi, CA. 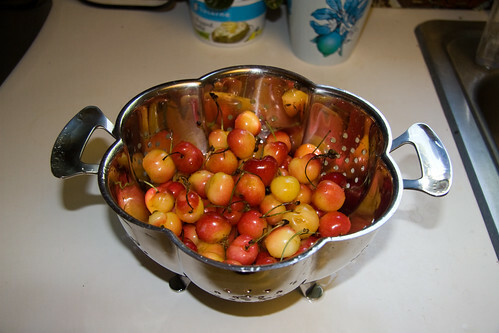 Rainers are the sweetest cherries that I could find at the market. They have golden flesh, and their skins are a mix of gold and pink. My previous experiments convinced me of two things: Muddling cherries does not concentrate their flavor enough and the proper sweetness requires an additional ingredient—namely sugar. The obvious move was the make a cherry simple syrup. 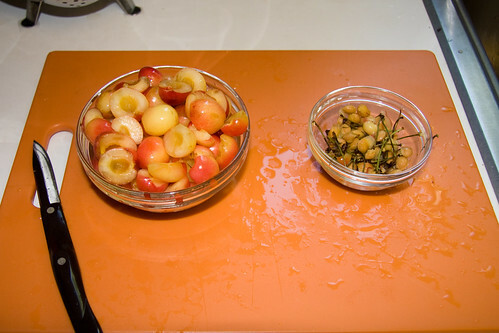 I pitted and halved two cups of cherries. Then threw them in a food processor and puréed them as evenly as possible. I poured the cherry purée into a saucepan and added 1/4 cup of water and 3 tablespoons of sugar. Then heated it very slowly over a low flame. Stirring frequently, I let the mix cook for about 30 minutes just below a simmer. 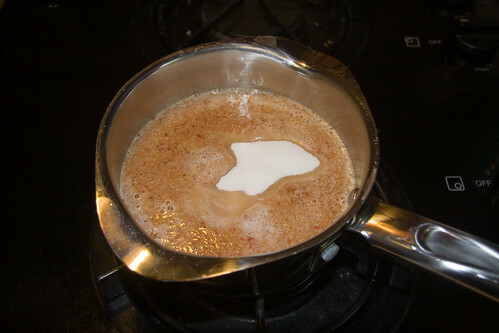 The red color deepened and it became thicker as the liquid boiled off. 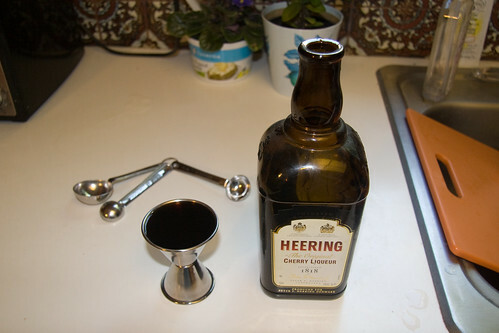 As it cooked, I added 1 teaspoon of orange blossom water because it seems to elevate syrups and 2 ounces of delicious Cherry Heering to give the syrup a touch of boozy cherry flavor. 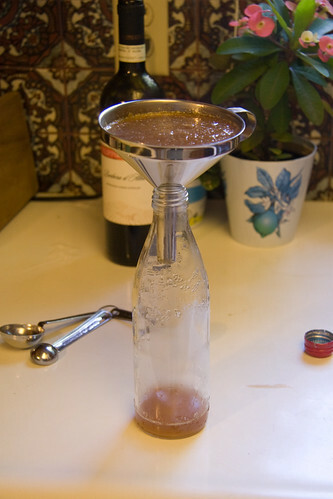 Once I liked the consistency, I let the syrup cool a bit, before straining it into a bottle. The resulting syrup still has some fine cherry flesh in it, but most of the solids have been strained out. To make the drink, I combined 1 ounce of the syrup with 1 1/2 ounces Jack Daniels. I stirred these up to mix them, then filled the glass with Coke (about 4 ounces) and floated a whole cherry on top. I still feel like the cherry sweetness could be pushed a bit further, and this was definitely a bit labor intensive to make a few drinks, but I do think this is the closest I’ve come to my ideal Whiskey Cherry Coke. It’ll definitely do for this summer.